Please contact owner Peter Email: petermathias61@gmail.com - Phone: 330-524-9670. Boat Location: Charleston, South Carolina. A well maintained blue water cruiser with a full 2017 BG navigation package. 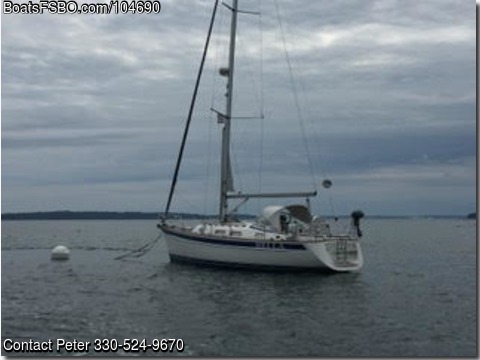 12" GPS, Auto helm with wireless remote, Wind, boat speed, depth, AIS transponder, Digital Radar, VHF with and held wireless remote, Chain counter, New AM/FM/CD Stereo w/ Ipod Connection in 2017, Teak & Holly Wood Flooring, Full Galley w/ Stove, Oven, Iso Therm Refrigerator, H&C Water, Head, Shower, Sleeps 6, Lots of Storage, Bilge Pumps, Coast Guard Package, New Rockna Anchor in 2017, Lumar Windlass w/ Auto Deployment, New Chain 2017, Fully Battened Main & Lazy Jacks, Roller Furling, Genoa, Assymetrical w/ Sock, 4 Self Tailing Winches, 3 Batteries w/ Switch, Dockside Power, New Bimini Top & Dodger in 2017, Pedestal Cover, Inflatable Life Raft, Docking Lines and Extra Equipment. Documented and Always Professionally Maintained.